With built-in temperature controllers, hands can stay warm with 3 heat settings. 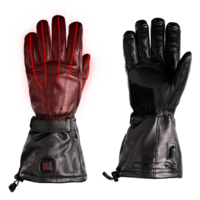 Plus, the leather material is a natural insulator that helps retain the heated glove’s warmth. Designed as one of the most comfortable heated gloves for riding, the Hybrid Heated Motorcycle Gloves are guaranteed to provide maximum comfort. Each pair is made with premium nappa leather that is soft to touch, but offers much needed durable and weather protection. Both the palm and fingers have reinforced leather to prevent wear-and-tear. The sleek, flexible design contours to the hand’s natural riding position.